Freeze drying is a relatively recent method of preserving food. It involves freezing the food, then removing almost all the moisture in a vacuum chamber, and finally sealing the food in an airtight container. Freezedried foods can be easily transported at normal temperatures, stored for a long period of time, and consumed with a minimum of preparation. Once prepared, freeze-dried foods have much the same look and taste as the original, natural products. 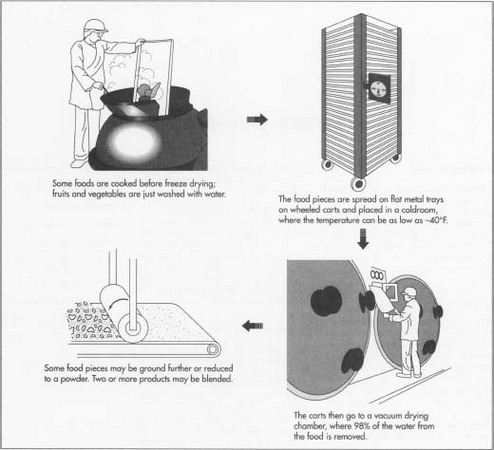 The freeze-drying process was developed during World War II as a method of preserving blood plasma for battlefield emergencies without requiring refrigeration or damaging the organic nature of the plasma. The technology was applied to consumer food products after the end of the war. Coffee was one of the first freeze-dried products to be marketed on a large scale. Today, many fruits, vegetables, meats, eggs, and food flavorings are freeze-dried. Freeze-dried food has many advantages. Because as much as 98% of the water content has been removed, the food is extremely lightweight, which significantly reduces the cost of shipping. This also makes it popular with boaters and hikers who have to carry their food with them. Because it requires no refrigeration, shipping and storage costs are even further reduced. Freeze-dried food is also relatively contamination-free since the dehydration process makes it virtually impossible for yeast and potentially harmful bacteria to survive. Finally, since the physical structure of the food is not altered during the freeze-drying process, the food retains much of its color, shape, texture, and flavor when it is prepared for consumption by reintroducing water. This makes it more attractive to consumers than food preserved by some other methods. One of the major disadvantages of freeze-dried food is its cost. The equipment required for this process requires a large investment of money, and the process itself is time consuming and labor intensive. These costs are usually passed on to the consumer, which makes freeze-dried food very expensive when compared to other methods of food preservation such as canning or freezing. Some foods are extremely well-suited to the freeze-drying process, others do not fare so well. Liquids, thin portions of meat, and small fruits and vegetables can be freezedried easily. Coffee is the most common freeze-dried liquid. Chunks or slices of shrimp, crab, lobster, beef, and chicken can be freeze-dried. They are often mixed with vegetables as part of soups or main course entrees. Almost all fruits and vegetables can be freeze-dried, including beans, corn, peas, tomatoes, berries, lemons, oranges, and pineapples. Even items like olives and water chestnuts can be processed this way. Thick portions of meat and larger, whole vegetables and fruits cannot be freeze dried with any success. With many other foods, it is simply not economical to preserve them by freeze drying. food-handling areas must be approved by the United States Department of Agriculture, and the company and its employees must adhere to government regulatory procedures. The plant may include a receiving and storage area for raw foods that arrive at the plant in bulk; a food cooking area for those foods that must be cooked before processing; a large area with several large freezing and drying chambers; and a packaging area. The facility may also include a research area where improved methods of freeze-drying foods are developed, and a test kitchen where new preparation techniques to improve the final taste, quality, and texture of the food are tried. Some plants are dedicated to freeze-drying only one product like freeze-dried coffee. Others process a wide range of meats, vegetables, and fruits. Nonfood products such as chemicals and pharmaceuticals are usually processed in separate plants from food products. The freeze-drying process varies in the details of temperatures, times, pressures, and intermediate steps from one food to another. The following is a generalized description of the process with several specific exceptions noted. 1 The food is first checked for contamination and purity. Fruits, meats, and some other edibles are tested for bacterial counts and spoilage. Much of the work of the plant is dependent on the harvest season for each food. In January, for example, the plant would be processing celery, olives, lemons, oranges, and pineapples. In July, it would process green beans, peas, and strawberries, among others. 2 Some kinds of food, like seafood and meats, must be cooked before freeze drying. They are usually purchased already cut into small pieces. If they have not been pre-cooked and frozen, these foods are placed in large, industrial-sized kettles and properly cooked. Fruits and vegetables are usually purchased already cut, pitted, and peeled. These foods are simply washed with sprays of water. Some vegetables, like peas and corn, are quickly scalded, or blanched, before freezing. Coffee is purchased as a pre-brewed concentrated liquid. Because the aroma of coffee is important to consumers, a small amount of coffee bean oil may be added to the liquid. Unlike the water, the oil is not removed during the drying process. 3 The food pieces are spread out on flat, metal trays which are stacked 20 to 30 high in slots in a wheeled cart. With food that has been pre-cooked and frozen, the trays are pre-chilled to prevent partial thawing during handling. With liquids like coffee, the pre-brewed coffee is poured into shallow pans. The carts are wheeled into a large, walk-in coldroom where the temperature can be as low as -40°F (-40°C). In this extremely cold temperature, the food is quickly frozen. There are usually a dozen or more coldrooms in operation, and the carts are kept there until it is time to move them into the drying chamber. 4 The carts are wheeled out of the coldroom and into a vacuum drying chamber. In the case of liquids like coffee, the frozen coffee is first ground up into small particles in a low-temperature grinder. The drying chamber is a large, long, horizontal cylinder with semi-elliptical ends. One end is hinged to open and close. When the trays of frozen food pieces are inside, the chamber is closed and sealed. In a large plant, there may be 20 to 30 drying chambers in operation at any time. 5 The drying procedure involves a process known as sublimation. In sublimation, a solid material is forced to change state into a gaseous material without ever becoming a liquid. In the case of freezedried food, the solid ice crystals trapped in the frozen food pieces are forced to change into water vapor without ever becoming liquid water. In the drying chamber, this is accomplished by evacuating the air with a vacuum pump to reduce the pressure to about 0.036 psi (0.0025 bar). The temperature of the food is raised to about 100°F (38°C) by direct conduction through the bottom of the trays, radiation from heat lamps, or microwave heating. When the chamber is evacuated of air, the pressure is below the threshold at which water can simultaneously exist in a solid, liquid, and gaseous (vapor) state. This threshold is known as the triple point of water. Once the pressure falls below this point, the heat causes the ice crystals trapped in the frozen pieces of food to change directly to water vapor. The vapor is drawn off and condensed within the chamber leaving the food behind. The dried food is filled with tiny voids, like a sponge, where the ice crystals were once present. Not only does this make it easier for the food to reabsorb water when it is prepared for consumption, but the dried food retains its original size and shape. The time for this drying process varies. Freeze-dried liquids make take only about four hours to prepare, while semi-solids and solids like soup and sliced meats may take 12 hours or more. 6 The dried food pieces are removed from the drying chamber and tested for moisture content and purity. 7 Some food pieces may be ground to a smaller size or may be reduced to a powder. Others may be screened to separate them by size. Two or more different products may also be blended together to meet a customer's specific specifications. 8 Freeze-dried foods must be sealed in airtight containers to prevent them from absorbing moisture from the air. Several types of containers may be used: plastic laminated foil pouches, metal and plastic cans, or metal and fiber drums for bulk packaging. Some freeze-dried food is vacuum packed, in which the air is evacuated from the container before sealing. Other food has an inert gas like nitrogen injected into the container before sealing to displace the oxygen in the air and prevent oxidation or spoiling of the food. The packaging is done in the freeze-dry plant almost as soon as the foods come out of the drying chamber. The plant can form, fill, and seal the packages to the desired weight for the end user. Packages that are to be sold directly to the consumer are packed in cartons, stacked on pallets, and transported to the grocery warehouse. Other freeze-dried food is packaged in bulk and sold to a secondary processor for incorporation into other food products. Freeze-dried blueberries, for example, may be sent to a company that makes pancake and muffin mixes. Each food has different processing, storage, and rehydration requirements. Some of the variables include the sizing of the raw food products before freezing, the cooking or blanching time and temperature, the rate of freezing and final freezing temperature, the rate of application of vacuum and the final vacuum pressure during drying, the rate and method of application of heat and the final dried product temperature, the allowable residual moisture content after drying, the storage temperature and atmosphere (vacuum, nitrogen, etc) after drying, and the rehydration procedures. At large freeze-drying facilities, electronic microprocessors regulate the times, temperatures, and pressures throughout each step of the process. A central computer collects this data, analyzes it using statistical quality control methods, and stores it for later reference. This assures that the food sent out to the public for consumption has been through a strictly controlled process that meets government guidelines and varies only slightly from batch to batch. The computer also collects data on the bacterial and moisture levels of the raw, bulk food products coming into the plant as well as the final freezedried products. Special equipment may include computerized gas chromatographs and oxygen analyzers. Even the packaging materials are tested for their ability to prevent water vapor and oxygen transmission. Food is not the only material that is freeze-dried. Pharmaceutical products such as antibiotics and vaccines are often preserved this way. Specialty chemicals, pigments, and ceramics powders are also produced using freeze-drying. Currently, there is development work on freeze-drying various aerosol sprays. One of the most interesting applications is freeze-drying flowers to produce bouquets that can be stored for many months before being reactivated to make "fresh" flowers. This would be especially beneficial for those who want flowers that bloom only during a short season. Considine, Douglas M., Ed. Food and Food Production Encyclopedia. Van Nostrand Reinhold Company, 1982. Hui, Y.H., Ed. Encyclopedia of Food Science and Technology, Volume 2. John Wiley and Sons, 1992.